In a harsh industrial environment, in shipment, or in storage, rust and corrosion can be a serious threat to your machinery. 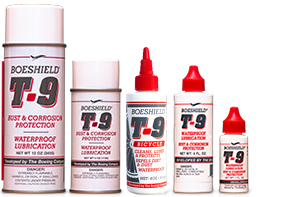 Boeshield T-9®‘s exclusive aerospace technology delivers superior, high-performance protection and lubrication that consistently withstands even the most constant and punishing use. Developed by global aerospace leader, The Boeing Company, T-9’s unique formulation of solvent carrier and paraffin wax coating was engineered to penetrate metal pores deeply, displace moisture, dissolve minor corrosion, and leave a clean, waxy coating with superior, long-lasting durability. T-9 protects all metals for months, including steel, cast iron, aluminum and copper, without harming paints, plastics and vinyls. Lubrication of moving parts inside assemblies. Cleans. T-9 attacks existing corrosion, loosens rusty parts and flushes out old lubricants. It is also extremely useful for drying wet parts, electrical motors and circuits, ignitions and connectors. Easy, fast and clean lubrication. Spray T-9 on and wipe off the excess for immediate use or leave on for maximum coating. T-9 dries to a waxy, waterproof finish without leaving a sticky film to attract dirt, dust or mud. Reaches deeper. T-9 stays liquid long enough to permeate metal crevices and seep deep inside assembled components to leave a durable protective coating that lubricates and protects—all without dismantling your equipment.